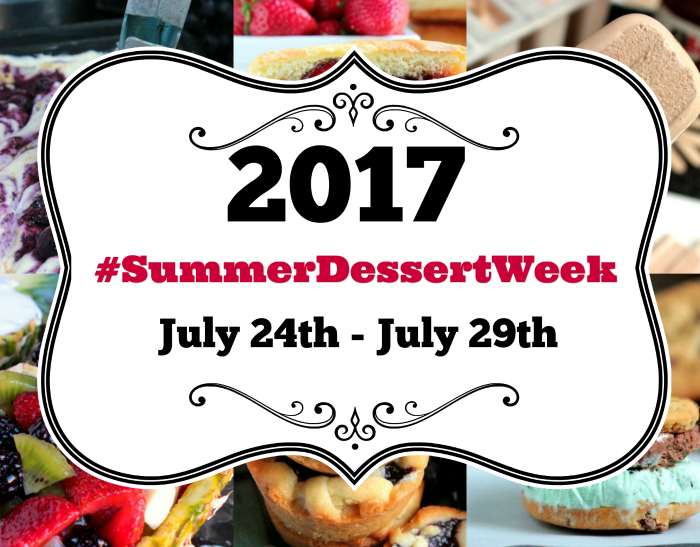 Welcome to the first day of #SummerDessertWeek. I’m so happy you’re here. This week-long event is hosted by Angie from Big Bear’s Wife. 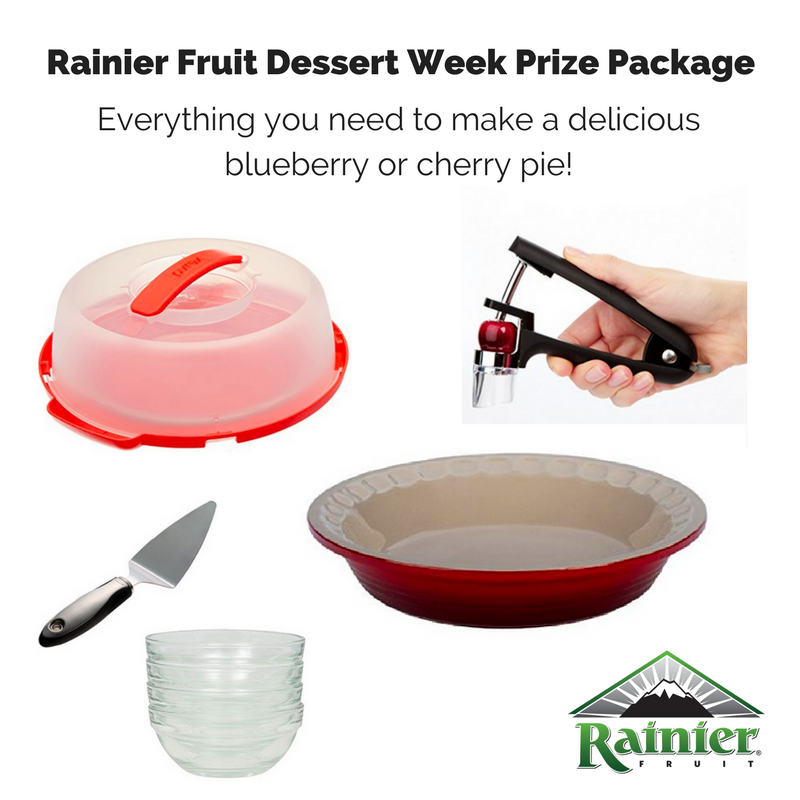 We’ve got a week’s worth of recipes for any dessert-lover, and giveaways too! 25 bloggers. 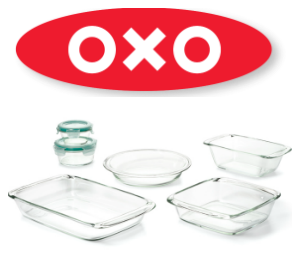 Over 70 recipes. 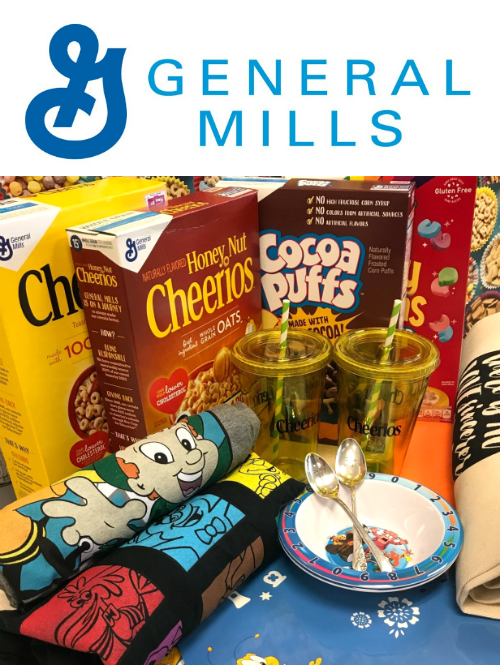 SIX (yes, you did read that right) great giveaways. All brought to you at the end of each post. So keep scrollin after the recipe, you don’t miss out on anything. This is a party you’re guaranteed to walk away from with a few new refreshing favorites, perfect for Summer. 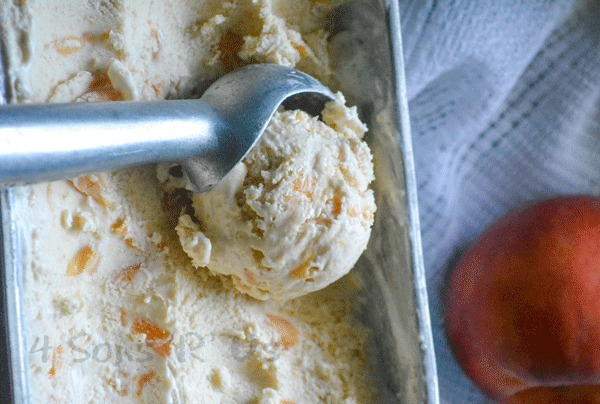 More on that later, right now let’s dive into a dish of our yummy Peaches & Cream No Churn Ice Cream. Summer just isn’t complete for me without a basket full of farm fresh, hand picked peaches. Luckily, we have several semi-local orchards where we can go. We make a whole day of it, often picnic lunching it on a blanket right on the mountain side. Finishing off our finger food lunch by biting into some of those juicy peaches for a fresh, sticky sweet dessert. 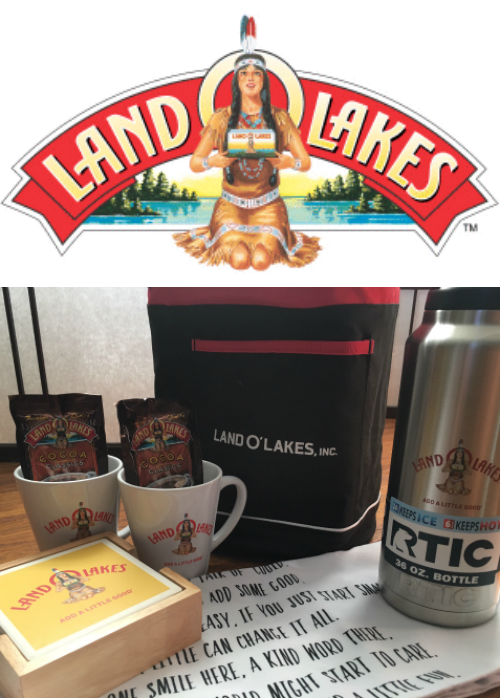 Knowing that we love the experience, and crave the flavors that remind us of it, it wasn’t something easy to go without. Luckily, I was able to combine those freshly picked peaches into one of our other favorite Summer desserts– a big ol’ bowl of cold, cream ice cream. Peaches & Cream No Churn Ice Cream specifically. Trust me when I say, that I would happily, and whole-heartedly, dive into a vat of this stuff. Peaches & cream is an essential Southern summer staple dessert, or breakfast, or snack– but we’ll stick with dessert for today. This recipe seamlessly blends the two into an easy ice cream recipe that’s the perfect way to cool down. 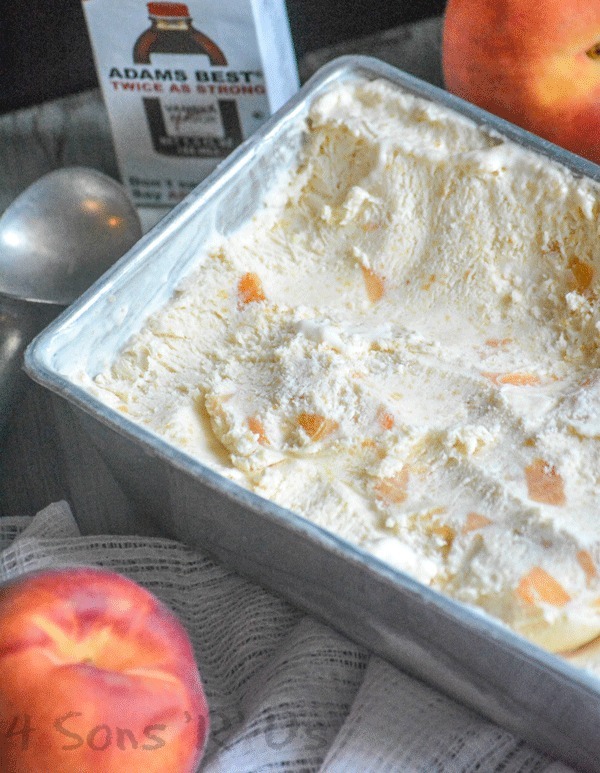 Freeze a batch of this Peaches & Cream No Churn Ice Cream today, and starting tomorrow you can focus less on the heat, and more on savoring the sweet. An ice cream that was made for Summer, this cold creamy treat features a perfect blend of fresh peaches & cream. Add the thawed peaches to a blender or food processor. Blend them until pureed and completely smooth. Set aside. In the bowl of a stand mixer, whip the cream until it's light, fluffy, and just until stiff peaks have formed. Don't over mix-- or you'll end up with butter. Stir in the sweetened condensed milk and vanilla until evenly combined. Stir in the peach puree until the mixture's completely incorporated. The ice cream should have an even peach color to it. Stir in the diced fresh peaches until they're dispersed evenly throughout the mixture. Pour the prepared ice cream into a large metal loaf pan, freeze just until the ice cream's frozen or up to overnight before serving. 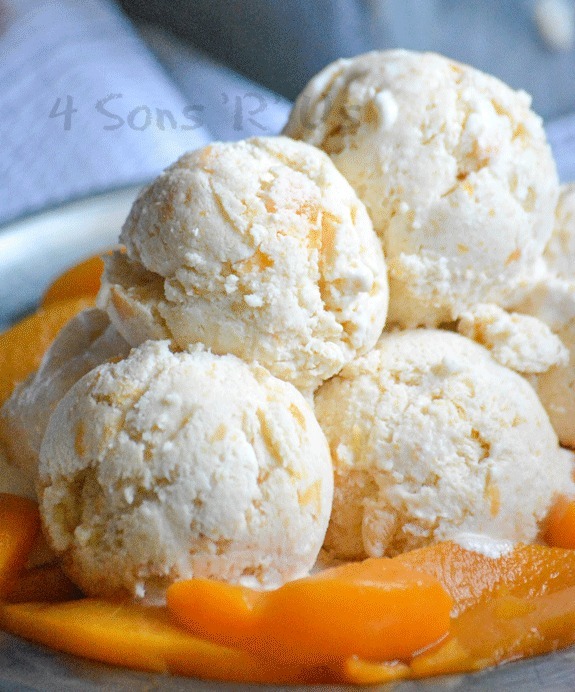 Sweet peaches, I’m in ice cream heaven with this recipe. 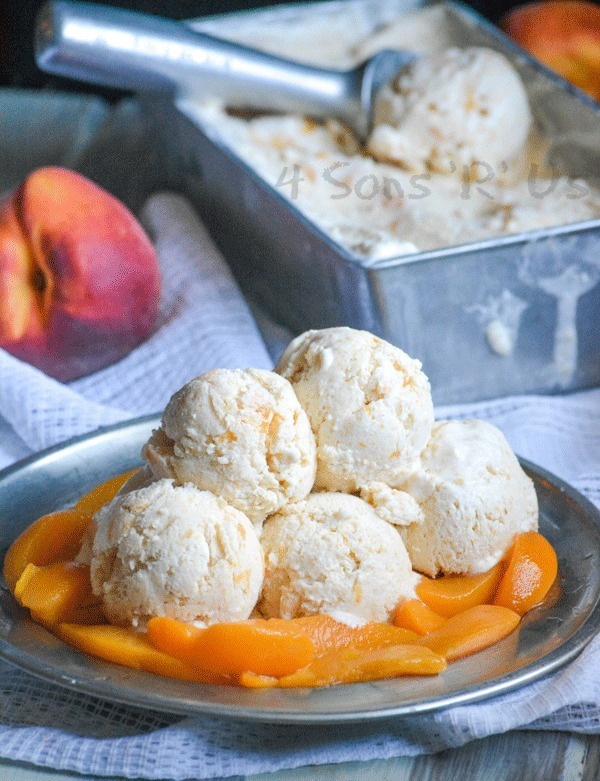 I love all no churn ice creams but I really LOVE peaches. I’ve loved them since I was little. 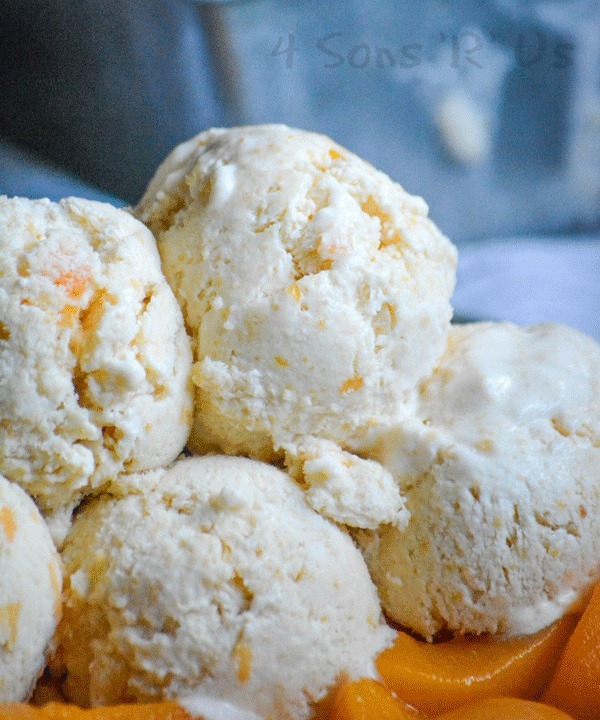 Peach ice cream is the best, isn’t it! You speak my language, Angie. 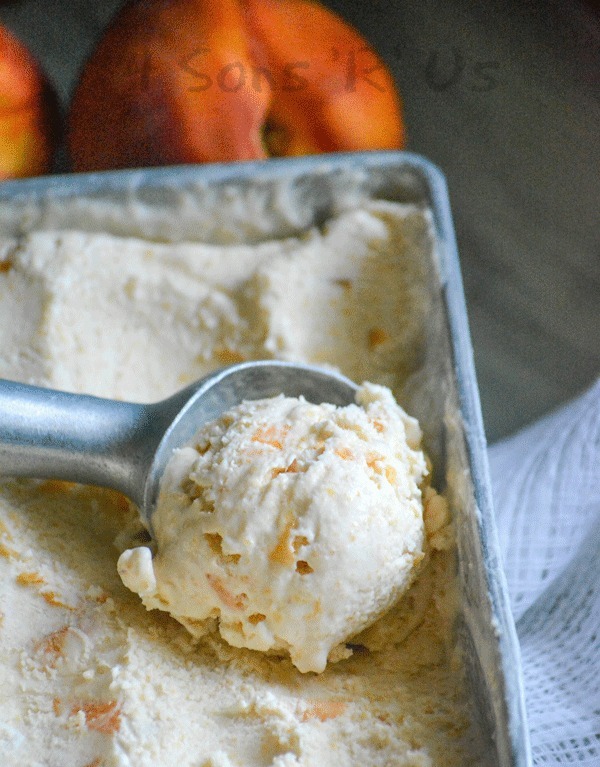 Peach ice cream is a summer must have for this gal, or it ain’t summer! I love fresh strawberry o’cheese dessert (which I sometimes make with peaches or nectarines–equally as good) Your recipe sounds delicious–thanks for sharing! See now I’m intrigued and must try this nectarine dessert you speak of. 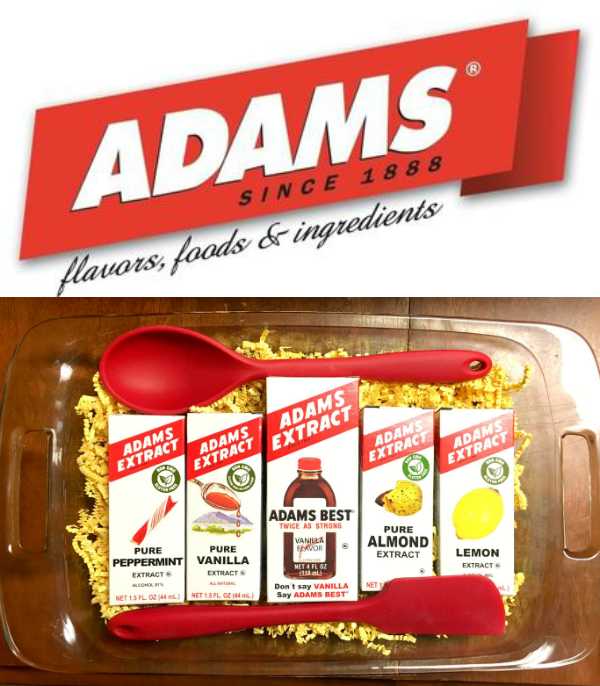 Ahh, the never-ending quest for amazing flavors, lol. Love that peaches are both blended into the base and stirred in as pieces. All the peach flavor! Yup, peaches + peaches + a little bit of cream in each bite = perfection. Vanilla was one of the ingredients but wasn’t mentioned in the directions? When do you add that? With the condensed milk. Thanks for alerting me to my goof of leaving it out. I’ve updated the instructions to include it now! Thank you for posting this to FF, I have pinned it for the future. What a great idea if you don’t have (or want to purchase) and ice cream maker. 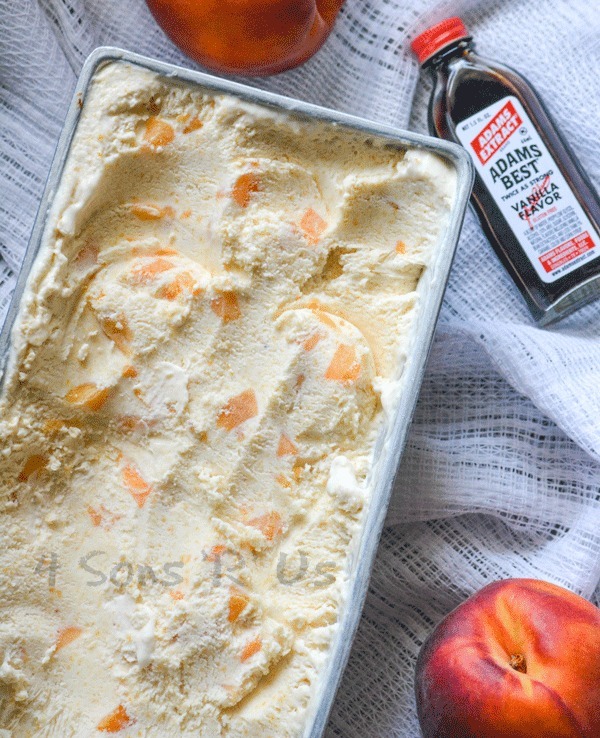 Can this be made wth all fresh peaches-no frozen? We went peach picking this week, and I have an abundance of fresh peaches! It absolutely can be! When they aren’t yet in season, frozen is just a cheaper (and sometimes more convenient) option. I made this recipe with my boyfriend today! We both absolutely loved it! It’s his favorite kind ofice cream and I was extremely happy to find a no-churn recipe online! Definitely planning on making this again! My husband’s name is Damian 🙂 Love that you enjoyed it so much!